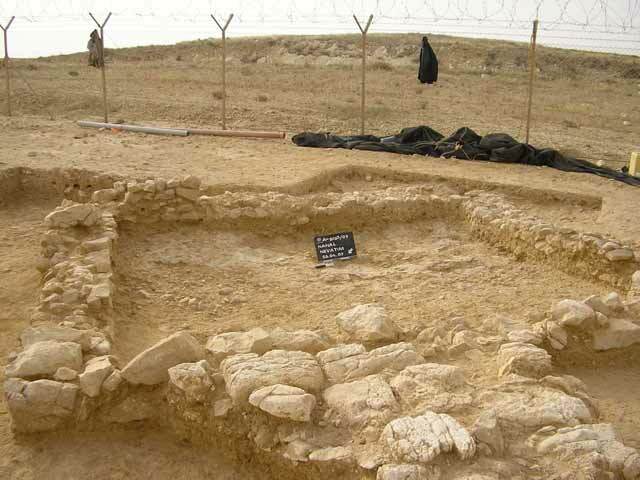 During April 2007, a salvage excavation was conducted east of Ramat Hovav (Permit No. A-5103; map ref. 191994–2047/560396–441), prior to the installation of a gas pipeline. The excavation, undertaken on behalf of the Israel Antiquities Authority and underwritten by the Israel Natural Gas-Lines Company, Ltd., was directed by V. Nikolsky-Carmel, with the assistance of Y. Lender (administration), A. Hajian (surveying), I. Lidski-Reznikov (drawing of finds) and laborers from Rahat. 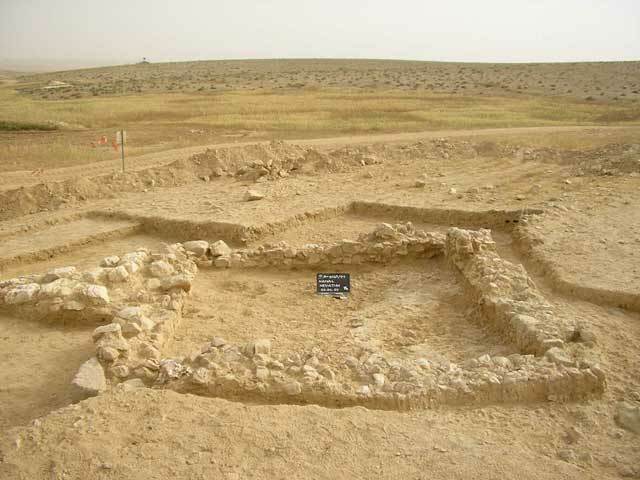 The site is located c. 13 km southeast of Be’er Sheva‘ and c. 8 km east of Ramat Hovav. Architectural remains and pottery fragments from the Byzantine period were discovered in probe trenches, dug at the site prior to the excavation, in which a building dating to the Byzantine period was exposed (c. 75 sq m). 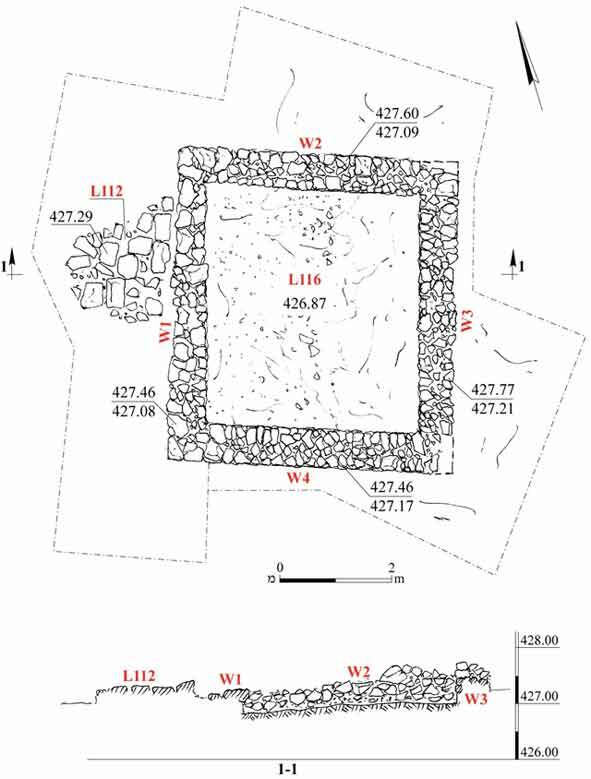 The building was square (5.0 x 5.5 m) and its walls (width 0.6 m, preserved height 0.3 m; Fig. 1) were built of roughly hewn qirton blocks, set atop the natural bedrock (Fig. 2). The interior of the structure was found filled with collapse of roughly hewn qirton blocks that had toppled from the walls of the building. The collapse of dressed qirton to the west of Wall 1 (Fig. 3) probably originated from the collapsed wall. The floor of the building was tamped loess. A few potsherds dating to the Byzantine period were found on top of the floor, including mostly bowls (Fig. 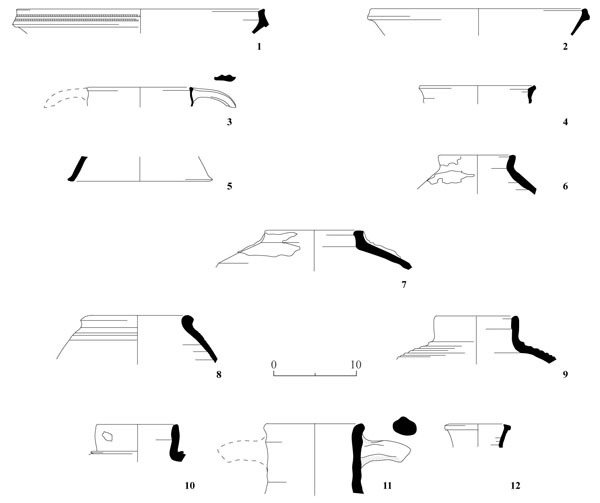 4:1, 2), cooking pots (Fig. 4:3, 4), a cooking-pot lid (Fig. 4:5), Gaza jars (Fig. 4:6–8), baggy-shaped jars (Fig. 4:9, 10), an amphora (Fig. 4:11) and a jug (Fig. 4:12). The building is typical of the watchman’s huts that are common to the south of Israel in the Byzantine period. 2. The building, looking north. 3. Collapse from Wall 1, looking east.